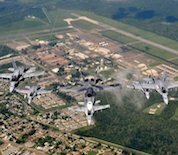 Naval Air Station Joint Reserve Base New Orleans is located in Belle Chasse, Louisiana, approximately 15 miles south of New Orleans. Units stationed on base come from all branches of the US Armed Forces with a mission to support homeland defense and US Coast Guard operations. The Alvin Callender Field serves as the base military airport. The on base campground, Aviation Arbor Recreational Vehicle Park, offers visitors a pleasant and affordable place to stay when visiting New Orleans and participating in the areas many festivals and events. This NAS JRB New Orleans directory features the critical info you’ll need to navigate through the many facilities and recreational opportunities available on base.